It is essential that a team works like a well-oiled machine when it comes to approaching Microsoft Dynamics 365 CRM projects. That's why we had a company team building event in Whistler to optimize our team to better meet all your needs. Most companies realize they have a business process that is probably not as efficient as it could be. Perhaps it is an Excel spreadsheet or an MS-Word document that is being passed around the organization in an inefficient manner. There is often the realization that if they take the disconnected spreadsheets and forms and back-ended them into a database, they can easily eliminate wasted time, rekeying of data, and eliminating some simple review processes and calculations. What starts out as a task to eliminate inefficiencies in one business process inevitably sprawls into another department. The touch-point of information with other departments or with customers and suppliers will definitely be inputs or outputs into the business process that you are making more efficient. Why not modify those processes too while you are at it? Before you know it, you have modified the business processes of an entire department. Changing business processes will also inevitably lead to changing job duties. The mundane error checking of paper forms or re-keying of information into various spreadsheets or miscellaneous forms is going away. What is left behind in a business process is the essence of what the job truly is and what only the human can accomplish. The human element in business processes is not going away with the current changing nature of business processes through electronic efficiencies but is now focusing employees on the higher value evaluations that are needed in business processes. We are removing the mundane work with technology and opening up our eyes to the true value employees (i.e., humans) play in a business process. Know your way around MSDYN365 CRM? We're looking for a new CRM developer to join our team! See below for more details to see if you're qualified for the position. Purely CRM is looking for a CRM developer to become a core member of our team. The CRM Developer will be a part of an agile development team, working on the deployment, customization and integration of Microsoft Dynamics CRM in the enterprise. Collaborate with other software developers, business analysts, software architects and IT professionals to implement Microsoft Dynamics CRM solutions. Develop and maintain a platform roadmap. Customize the system to meet the business needs of the client. Integrate existing systems and services into the CRM architecture. Assist with deployment and provisioning activities. Completed a Bachelor's degree in Computer Science, Software Engineering or a related area. Demonstrated proficiency in installing and deploying CRM Organizations. Demonstrated proficiency in customizing and creating CRM entities. Experience with source control management systems and continuous integration/deployment environments. Proven communication skills with both internal team members and external business stakeholders. Strong initiative to find ways to improve solutions, systems, and processes. Established in Vancouver, Purely CRM Consulting Inc is 100% focused on Microsoft Dynamics CRM. As a team we have been involved with Dynamics CRM since version 1.0 which dates back to the early 2000’s and we bring a combined 50+ years’ experience. We stand behind Microsoft Dynamics CRM as a platform and the quality of our work in order to provide the best service for our clients. Our offices are based in Yaletown but we have clients throughout GVRD and our work takes place at our office and client sites, so you must have the means to travel to client sites. Local candidates only: Vancouver, BC. Candidates must be legally entitled to work in Canada. At Christmas time, we all tend to think of family. Well, the Purely CRM team is no exception. We brought our family together yesterday to have our annual employee Christmas lunch. Lunch this year was at Nightingale in Vancouver. If you are a foodie and looking for amazing food in this city, you can do no wrong by going to Nightingale. Purely CRM continues to grow as a family and we continue to do more and more Microsoft Dynamics 365 CRM projects. Our wishes, as always, are to deliver exceptional implementations of Microsoft Dynamics 365 CRM and to continue to grow a healthy and happy family. 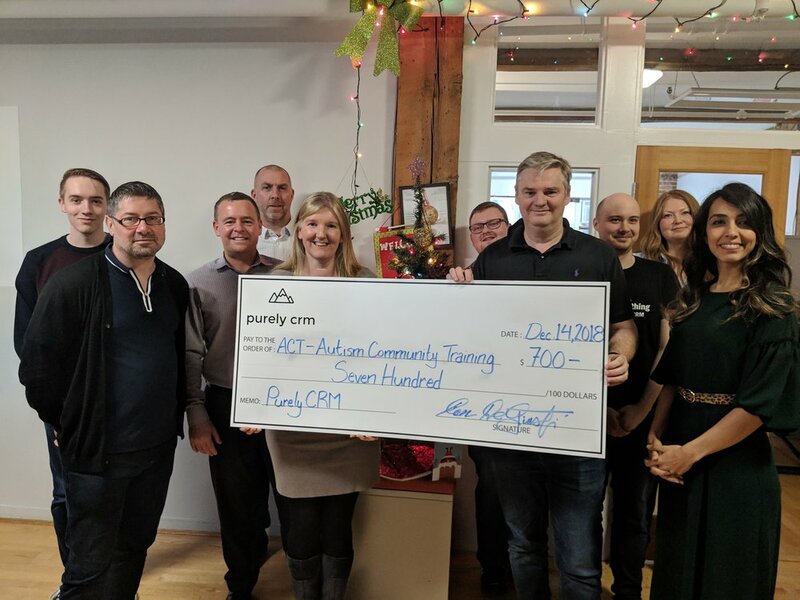 It’s the season of giving and it’s important that we take every opportunity to appreciate how fortunate we are, and that we ensure that we give back to the community just as much as we receive. This year we will be donating to the Greater Vancouver Food Bank along with gifts to keep those in need warm through the winter. We wish everyone happy holidays and a happy new year. Curious about how one of our partners got started in her career? Read all about our very own Nicola Cadwell in the beginning of her career, before becoming a partner at Purely CRM. Big thanks to CGMA Magazine for the article, read all about it here. We're celebrating Purely CRM's 3rd birthday today, and we're so grateful for all the support that we've received up to today. We can't wait to see how much more we'll grow as a company in the upcoming year. Thank you everyone! What better way to spend a rainy day inside with a team Lunch n' Learn about teamwork? Kicking Off Our Latest Project! We're excited to be kicking off our latest project in the Nation's Capital! Thank you to Rimex for joining us in an interview on how our CRM integrations have helped their manufacturing processes. Watch the video below for our in-depth interview on what a difference CRM has made for them. Purely CRM and our mobile team have been working hard on a project together in designing a mobile app. Last night, we were finally able to celebrate a successful mobile launch! Our friends at Balsamiq sent over this great T-shirt with a slogan that cannot be more true and they've nailed it with their software. Many new features are coming, here are some of our highlights. For a simpler and more consistent user experience, all interfaces are now fully unified as of the Spring release, with the web browsers as an intermediate interface so far. The web browsers will move to a fully unified interface in the Fall 2017 release. Many common complaints and modernizations have been addressed, as well as tabs returning to the web interface instead of the dropdown menu. Multi-select option sets are coming too! There will be no more need to simulate a multi-select option set. The long-awaited Business edition plan is finally launching, suitable for SMB companies (<250 users). Simple to set-up and low cost, it is an easy starting point to purchase needed apps. As your organization grows, it will be easy to upgrade to the Enterprise plans. However, this update is delayed from June 1st to September 1st due to a big launch for the product that is scheduled at that time. A new and improved Marketing app is launching, with a much better module compared to the old module. There is a directional move towards the Adobe Marketing Cloud as a preferred solution, once Adobe has finished integrating with Cloud 365. This will be available for Business plan customers and Enterprise plans. See below for some of our photos from the briefing! 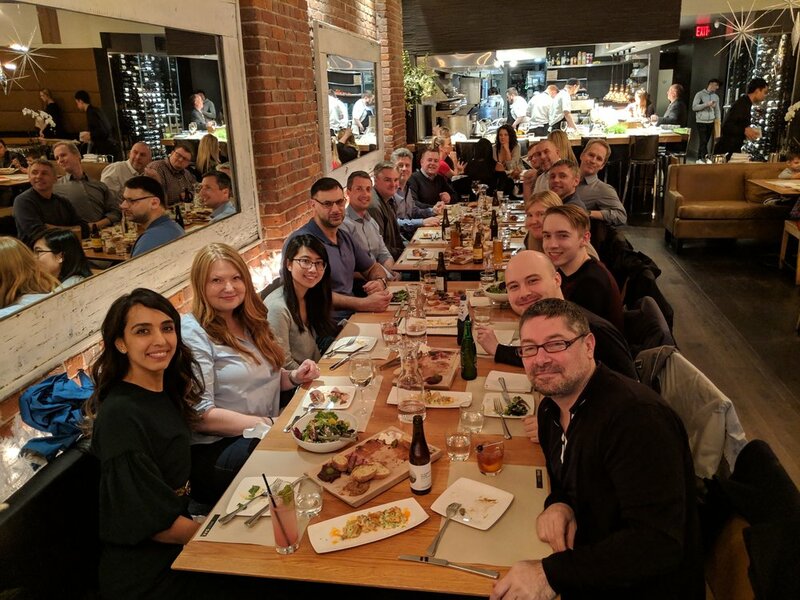 It was amazing to see so many of our customers come out to the Purely CRM 2015 Holiday party this year. We were honoured with the opportunity to see so many of our clients in a casual setting like we had. We would like to thank each and every one of you who had the opportunity to come out and mingle with us. Next year we will have to pick an even larger venue! We can not believe that another year has already past! The time just flies when you spend the time doing what you love and have great, great customers. We have been growing so fast that we have actually had to move offices twice this year because we have simply outgrown our old spaces. Not only has our customer base grown, but our staff have grown enormously as well. We all look forward to finishing up the year with a full head of steam and continuing to service our customers with what we love to do most: consult on customer relationship management software. We Wish You All Happy Holidays! With an open floor plan concept and multiple breakout spaces, Purely CRM's new office is a fabulous place to work. In addition to the functional aspects of the work space, the aesthetics of the exposed brick, the old growth lumber, and the spiral staircase in the entrance way add a level of interest to the space. Twelve specialized CRM experts. One office. The Vancouver office is home to twelve specialized Dynamics CRM consultants. These consultants are currently working on various Dynamics CRM projects in BC, Alberta, and North Carolina. Each one focused specifically on customer relationship management projects with a focus on Microsoft Dynamics CRM.